Ethiopia is the birthplace of coffee. According to legend, the great discovery came about when a goat herder named Kaldi noticed that the bright red berries made his flock extra frisky and brought a sample to the local elders for investigation. They thought the berries might be evil and threw them into the fire; a delightful toasty smell arose from the flames and a worldwide caffeine craze was born. While countries as far afield as Vietnam and Brazil have since eclipsed Ethiopia's coffee production, the drink remains as important as ever in Ethiopian culture. 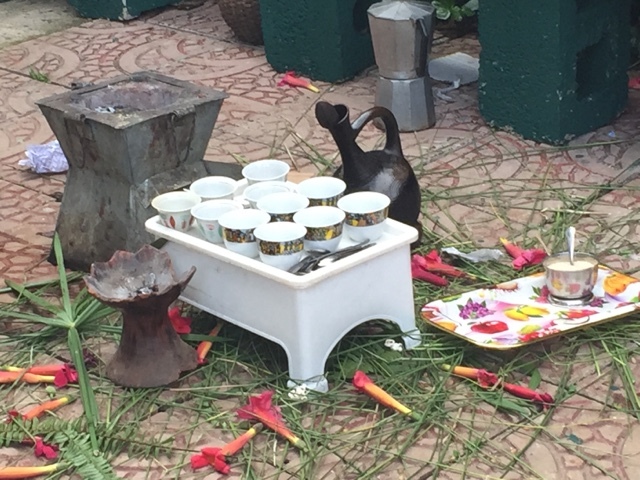 Ethiopian coffee isn't just a beverage - it's a ritual. It starts with green coffee, which has been separated from the cherry and dried. In some parts of Ethiopia this may have been collected from wild coffee trees and dried on big sheets in the sun, as Ethiopians have been doing for millennia. Your coffee preparer then roasts the beans right there on a charcoal stove, stirring and shaking the husks away, while the smell of roasting beans mingles with the scent of burning incense. She (always a she) then grinds the beans by hand with a mortar and pestle and brews the coffee with water in the traditional clay pot. After being strained through a filter, the coffee is ready! Ethiopians drink their coffee with lots of sugar but no milk, and it's usually accompanied by savory snacks such as popcorn or toasted barley. Three rounds of coffee is traditional, so I hope you're not in a hurry. The traditional coffee ceremony is still popular, but it's not the only way to get your fix these days. The Italians introduced Ethiopia to fancy new methods of making coffee during their attempts to colonize the country in the early 20th century. Espresso and macchiato (like pizza and pasta) proved much more popular here than Mussolini did, so today you can get quality espresso all over Addis and in most of the regional centers as well. More recent coffee innovations have also started to trickle in, so if you believe Chemex pour-over is the only coffee worth drinking, I know just the place.